Ever see a horse drawn carriage or buggy driving on the street? 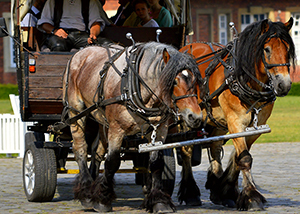 Avoid a car accident with persons riding animals or driving animal-drawn vehicles. While less common in the cities, this is a normal site in rural areas, especially as the weather gets warmer. Washington law allows this and treats anyone riding an animal or using animal-drawn vehicles on the road the same as a car. This means they must abide by the same laws, and the same rules (as far as practical) as a car. This also means they get the same rights on the road as a car, including right of way and space. Anytime you are driving near an animal being lead, ridden, or pulling a vehicle, be sure to slow down and give plenty of space. The animals may be easily scared, so do not honk your horn or make loud noises. 46.61.025: Persons Riding Animals or Driving Animal-drawn Vehicles. Every person riding an animal or driving any animal-drawn vehicle upon a roadway shall be granted all of the rights and shall be subject to all of the duties applicable to the driver of a vehicle by this chapter except those provisions of this chapter which by their very nature can have no application. When driving downtown Spokane near Christmas time, you may come across the famous Wheatland Bank Horse and Carriage Rides. These rides operate after thanksgiving through Christmas on the roads of downtown Spokane, allowing riders to enjoy the sights of Spokane. Their “clip-clop” is a well-known sound here in Spokane, and is a highlight of the holiday season for locals and visitors each year! If you are injured while riding and animal, or in an animal-drawn vehicle, or injured by a rider or animal drawn vehicle, you need an experienced attorney on your side. Our experienced and knowledgeable attorneys at Parke Gordon Law Firm will work hard to get you the compensation you deserve. Contact the law office of personal injury attorney Mat Parke today for a free consultation. This is your opportunity to speak with an experienced personal injury attorney about your case for free. Call (509)482-7274 to get started on receiving a fair settlement from your personal injury case.